It inspired people from Manchester to Moscow, led to thousands of arrests, and continues to generate debate. The Occupy protest movement, founded to oppose corporate greed and inequality, is this week celebrating its first anniversary. For many of those involved it has been an emotional and life-changing journey. Inspired by the Arab Spring and a massive Spanish protest movement that had bloomed earlier in 2011, the Occupiers formed a make-shift tent-city a stone’s throw from Wall Street, where public assemblies and discussions were held. As the size of the camp quickly grew, international media attention soon followed. Before long, Occupy became a contagious phenomenon, spreading across America and across borders to more than 80 countries on almost every continent. Ed Needham, 45, remembers the birth of Occupy well. The 45-year-old communications strategist was attending a conference for organisations working for progressive causes in Washington DC. He was approached by an activist who told him about a new protest called Occupy Wall Street in New York, which had begun a few days earlier. He decided to visit, was immediately impressed by what he saw, and joined in with the protest. “For me Occupy represented a reaction to where we were as a society,” Needham says, recalling his first impressions. “I just thought that this was an extremely historical moment and that instead of some fly by night political party initiative or something, that this was the beginning of a social movement. And everything that has happened since has affirmed that. A crucial aspect of the Occupy movement was its cross-generational appeal. In the first few days it was characterised mainly as a youth movement, but as it grew that changed. Organised labour groups eventually got involved, as did senior citizens, war veterans, high-profile academics, musicians – even people who had worked within the financial sector. “At that point it just took off because people could no longer characterise the people down at the square as a bunch of hippie kids,” Needham says. To date, there have been more than an estimated 7000 arrests of activists participating in Occupy protests across the US. The main camp in New York was evicted in November, but today the movement continues. The activists are currently collaborating on international actions to mark the one-year anniversary, and they still meet regularly and organise protests outside banks and run “teach-in” educational groups about economic issues. Though some activists are pessimistic about the level of change they have managed to achieve, most believe that at the very least they have managed to shape mainstream political discussion by putting more focus on problems related to inequality. New splinter groups have also taken shape due to Occupy, with activists using different protest tactics to voice their discontent about the current status quo. Los Angeles-based artist Alex Schaefer garnered media attention last year for expressing his indignation at the greed of the banking sector in a creative manner – by painting pictures of banks on fire. Schaefer is hugely frustrated at how little has been done in America to hold the financial sector to account for bringing the country’s economy to its knees, and he recently started a new trend that is beginning to catch on in various cities. He calls it “chalking” – a form of civil disobedience that involves drawing information about bank wrongdoing in chalk on pavements outside bank buildings. So far Schaefer has been arrested once for vandalism, but the charges were eventually dropped. He says the tactic was in part borne out of a deep dissatisfaction that nothing was being done to address the issues raised by the Occupy movement. In England, activists speak of the same frustration. Occupy spread to London in October last year, with a large encampment established outside St Paul’s Cathedral near the city’s stock exchange. Small campsites eventually formed in a number of cities across Britain – from Glasgow and Edinburgh in Scotland to Liverpool, Manchester, Birmingham, and Sheffield in England. But most of the camps were either evicted or slowly disbanded as the cold bite of winter set in – and some protesters feel that they failed to agree on a coherent message across the different sites. Daniel says that he found Occupy in London to be “quite brilliant” and well organised. An empty office block that was squatted by the activists in London’s financial district and turned into a giant makeshift community centre called the Bank of Ideas also impressed him. However, in Liverpool he says groups including the Socialist Workers’ Party “appeared intent on co-opting, while not overtly supporting the movement, which was predictable and divisive.” And at some Occupy camps he visited, the initial energy which had catalysed the movement became diluted. Other protesters had similarly negative experiences of camps outside London. In Birmingham, activist Tom Holness said the camp had included people who believed in “Jewish banking conspiracies” and a member of the far-right English Defence League, which dissuaded new people from joining. “The Facebook pages were a mess of arguments and conspiracy theories and that put a lot of people off,” he says. Yet despite its flaws, Occupy as a movement is likely to persist in some form at least for the foreseeable future. The issues driving it, such as rising unemployment and a growing disparity between rich and poor, have not been addressed. And many activists, though they are tired and frustrated, are still intent on pushing for change. In Spain, the movement that preceded Occupy may offer a glimpse of what is to come. Thousands took to the streets across the country last summer to protest against austerity measures, corporate power and political corruption, camping out in public squares and holding lengthy debates in a bid to find solutions to economic problems. Calling themselves the Indignados (the indignant) they continue to organise demonstrations and political actions, weary but energised by groups in other parts of the world. As a result of the Indignados movement, locally organised public assemblies are now held regularly in cities including Madrid and Barcelona for anyone to come and address grievances. Though unemployment is soaring in Spain and the protesting has not managed to achieve substantive political changes, it has brought people together in a way that has in itself had a positive and lasting impact. The “we are the 99 per cent” slogan has come to symbolize the movement, and was used by protesters in countries around the world. It is intended to draw attention to the disparity between rich and poor and is a reference to the statistic that in the United States, the upper 1 percent of Americans are now taking in nearly a quarter of the nation’s income every year. Occupy Wall Street reportedly sparked copycat protests in more than 80 countries across the world. Protesters marched and formed Occupy groups in countries including Australia, England, Canada, Belgium, France, Denmark, Italy, China, New Zealand, Ireland, Scotland – even Armenia and Nigeria. The movement also attracted a diverse selection of supporters: from rapper Jay-Z to supreme leader of Iran Ayatollah Khamenei, who predicted that Occupy would “bring down the capitalist system and the West." The Occupy movement is widely considered to have begun on 17 September 2011, when activists in New York set up a makeshift campsite in the city’s financial district. The American protesters took influence from pro-democracy revolutionaries in Tunisia and Egypt, and they were also greatly inspired by a Spanish protest movement that was launched in May 2011 by a group calling itself the Indignados (the indignant). 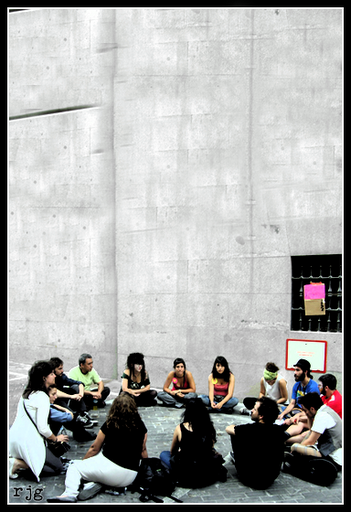 The Occupiers structured themselves without formal leaders, reaching decisions by consensus often after long debates attended by hundreds of participants. This article first appeared in issue no.945 of the Big Issue north magazine.